As sports parents, we all strive to be positive and happy role models for our children. Unfortunately, the stresses of sports can bring out the negative in us if we don’t try to keep an actively positive mind. 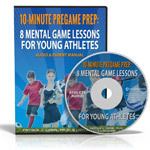 The trap is that well-meaning sports parents can undermine their sports children’s confidence, which eventually will lead to less fun and lower performance. The first thing to remember as sports parents is to avoid making comparisons. According to Janis B. Meredith, author of 11 Habits of Happy and Positive Sports Parents, comparing your child to another athlete or sibling may seem like an efficient motivational tactic, but actually, it’s effect is short-lived, if it even has a positive effect. Negatively comparing your children to each other or others will only harm their confidence, and while it might inspire a short burst of effort, in the long run it will hurt sports kids,’ confidence she says. Here at the Ultimate Sports Parent and Kids’ Sports Psychology, we agree. Comparisons lead kids to put others on pedestals. Instead, your athletes should be focusing on their own strengths! 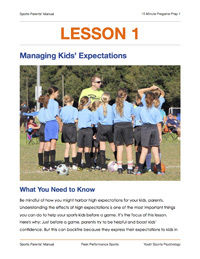 In addition to avoiding comparisons, sports parents should remember that the purpose of sports is to have fun and learn valuable lessons that will help your children grow into confident adults. You want to build teamwork, communication, confidence, values, and integrity via sports participation. None of this has anything to do with winning or losing, so stop worrying about the score, stats, scholarships, and instead focus on the process, says Meredith. What’s more, she says, you need to tell them you love them and show unconditional love no matter how they perform. Most kids feel pressure to perform well for parents–even when you are super supportive. 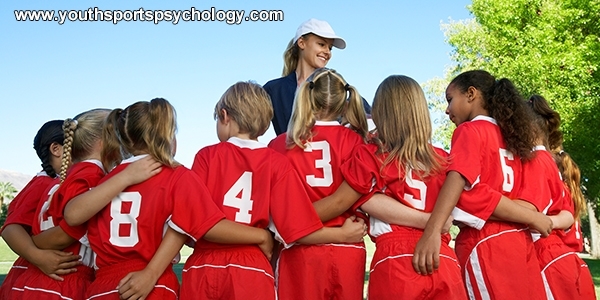 Communicating that we love our children helps them learn the right lessons from the sports they play. It helps build their confidence, and encourages them to have fun expressing themselves in sports. Kids pick up on the way you act on the sidelines; remember to be positive and let go of your own frustrations.